Bring approximately 2 quarts of water to boil in a large pot. Add onions and boil for 3 minutes. Drain and rinse with cold water. Slice root-end off onions and squeeze onion from top end to remove peel. Discard peels and set onions aside. 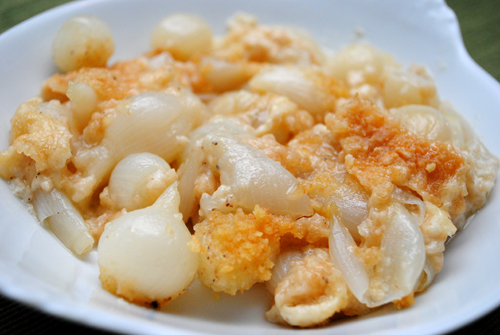 Preheat oven to 350 degrees-F. Place onions in a 2 quart glass casserole dish. Add salt and pepper. Melt butter and pour over onions. Pour milk over onions. Sprinkle cracker crumbs on top. Bake casserole for 50 minutes. Let onions cool for several minutes and serve as a side dish.